This water-based hydrating sheet mask with Hyaluronic Acid, an ingredient naturally found in skin, floods skin with intense weightless hydration. Free of mineral oil and parabens, this non-greasy, intense glow-boosting formula, with Sakura extract, hydrates, illuminates and enhances skin's radiance. 1. Start with clean skin. Gently press the sheet mask on to the face with the blue side on top. 4. 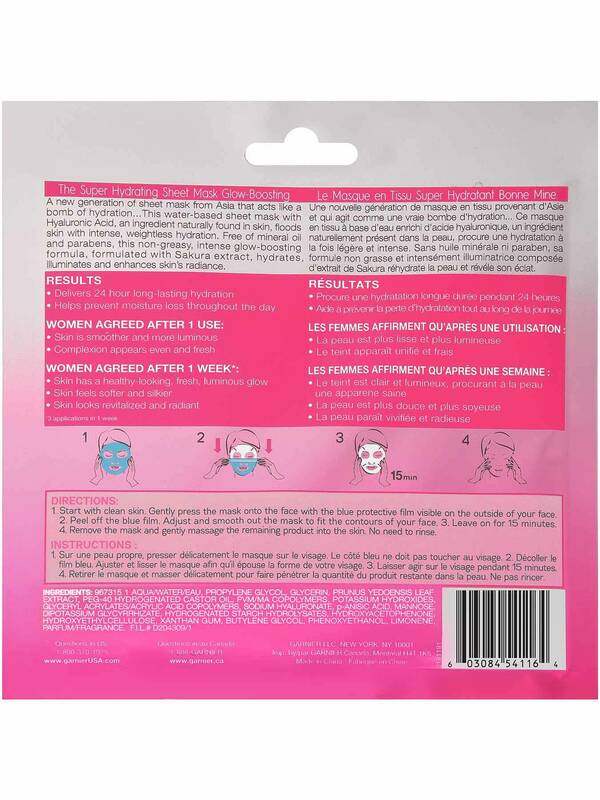 Remove the sheet mask and gently massage the remaining product into the skin. No need to rinse. Rated 5 out of 5 by Paigeygill from Awesome!! Absolutely love it! It leaves my face feeling so smooth and clean! I have used each face mask. I would highly recommend any of the face masks in this brand! Kind of hard to find in store though. Rated 5 out of 5 by Goldy_slg from Overall happy with the mask I received a mask as a free sample. I found it a little confusing to make sure the blue side was facing out as described in the directions as even the blue film is slightly sheer and the mask is folded in the packaging. Once the mask was on my face I made sure to adjust to my face shape. The mask seemed stretchy enough to conform to my face contours. I found it relaxing to wear the mask. I would say that about 10 minutes in I gently tapped the mask with my finger tips to help product absorption. I was compelled to do so after reading other reviews that thought that the mask was almost overloaded with serum and it did not absorb as quickly as desired. When I took the mask off the residual serum was not sticky or I comfortable. I believe tapping my skin gently with my finger tips did help with overall product absorption as I felt that the remaining product absorbed easily once the mask was removed. I would buy this mask in the future. Rated 3 out of 5 by strawfruit from It was okay. Just used this mask today and it felt nice while it was on. When it took it off it took awhile for the serum (?) to dissolve into my skin. I just ended up wiping away most of it with a paper towel. What makes me not want to try it again is that it was sticky. After I wiped it away, my face felt sticky (not very sticky but definitely tacky). It went away eventually. My face feels fine now but I didn't like the sticky part. 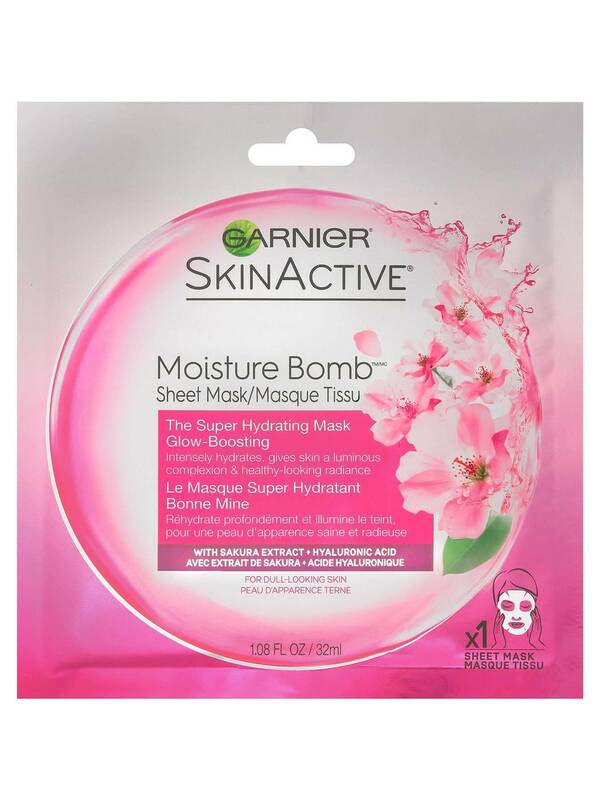 Rated 5 out of 5 by Jennie909 from Love love love The best masks I've ever used. I've been struggling with dry skin for year and this helped!!! Rated 5 out of 5 by TerriAna from great hydration I bought this to use after 20 hours of flights (the 15 hour flight from the US to Australia dehyadrates my skin terrbily). This mask was easy to use and my skin felt hydrated and wasn't flaky as it normally would be after a long flight. I used another one after the flight back to the US with the same results. I am a forever customer now.